The planners of the event have laudatory words for Governor Obiano for marshalling the ship of state in a manner shorn of political or religious divides. Promoting social harmony through religion is a cherished path to tread. It is indeed a sight to behold on Saturday, December 8, when Francis Cardinal Arinze, Prefect Emeritus of the Congregation for Divine Worship and Discipline of the Sacraments at the Vatican, stands upfront to lead the Pontifical Mass ushering in special awards by the Catholic Church to Governor Willie Obiano of Anambra State and two leading Anglicans in the state, Chief Obi Adimora, and Barrister Chidi Amamgbo. The epochal event which will be chaired by Engineer Edwin Enwegbara, a hydrologist and former President of the Nigerian Water Association will go a long way in showcasing Anambra State as the homestead of religious tolerance. According to the planning committee, “The governor conducted his campaign with dignity, compelling other candidates to toe his line of peaceful conduct. Consequently, Anambra became the first state in Nigeria’s history to conduct such a major election without incidents of violence before and during the elections and even after the result was declared in which Obiano won overwhelmingly in each of the 21 Local Government Areas of the state. For the first time in the history of Anambra State, candidates of the major parties accepted a gubernatorial election result and went on to congratulate the winner in writing. To cap it all, leading members of the so-called opposition parties, including gubernatorial candidates in the election who contested against the governor were present at Chief Obiano’s second inauguration on March 18, 2018. There is a lot the nation has to learn from Anambra State, especially considering how violent the state politics used to be. For instance, a sitting governor was kidnapped and followed with three days of mayhem over a mere disagreement with fellow party members in 2003 and 2004”. It is indeed a very interesting revelation that when the other eminent award-receiver, Obi Adimora, an entrepreneur and philanthropist, heard informally that Cardinal Arinze had no vehicle when he was retiring as Prefect for the Congregation of Divine Worship and Discipline of Sacraments in Rome, quietly bought him a brand new Prado SUV. Adimora is thus being “honoured for reflecting ecumenism in truth and spirit because one of the greatest prayers by our Lord Jesus Christ is ‘for all shall be one’ (John 17:21)”. 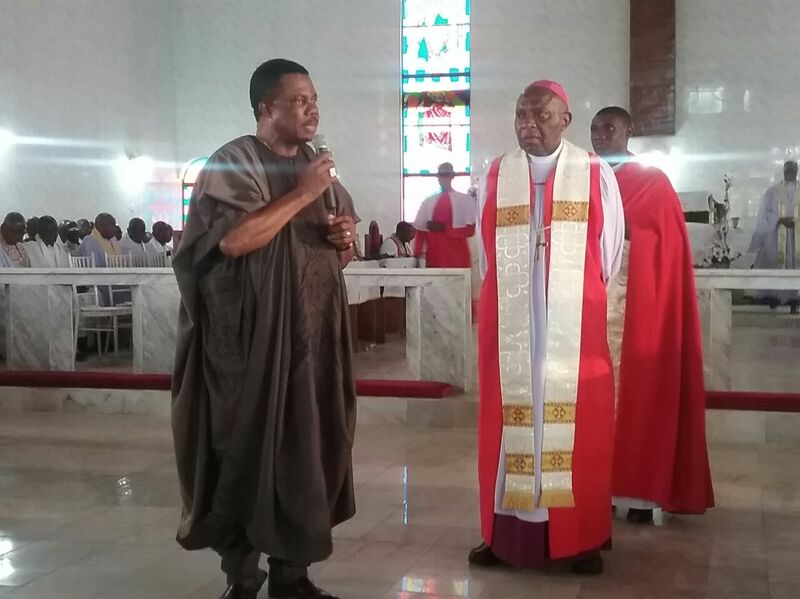 Professor Chukwube and Architect Nwabineli are full of gratitude to Cardinal Arinze, who marked his 86th birthday on November 1 and the 60th priestly ordination on November 23 in Rome, for accepting to lead the mass honouring the three Anambra persons for promoting social harmony. The Anambra State Commissioner for Information and Public Enlightenment, C. Don Adinuba believes fervently that intervolving the Catholics and the Anglicans as championed by Governor Obiano and encouraged by Cardinal Arinze can only bode well for the Nigerian dream of the aspiration of all.